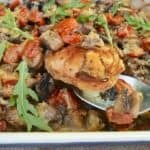 Delicious Italian-Style Chicken is perfect for early Fall weather, not too rich, yet filling and the casserole is packed with low-calorie veggies ! Italian-Style Chicken would soon become your family favorite too. Especially if you like Italian food for one, and also are a fan of mushrooms, lots and lots of mushrooms ! Italian Meatball and Pasta Sticks make a fun, unique appetizer, lunch or light dinner Surprise your family with these Italian Meatball and Pasta Sticks for dinner one night or perhaps at lunchtime.